Samsung Gear VR in an affordable way you can get started with watching 3D movies in VR. 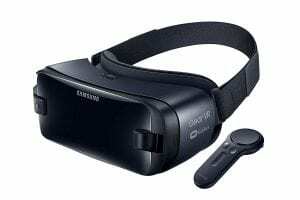 These VR headsets are easily accessible and affordable so everyone who has a compatible Samsung phone can actually get a Gear VR for themselves. There are quite a few apps that you can use in order to watch a 3D movie in Gear VR, however, the major problem lies in the fact that there are not so many movies that are in the format which you need to watch a 3D 360-degree movie in VR. So, you might have to convert some movies in that format and then actually go ahead and store it in your phone memory in order to watch it on your Gear VR. There are apps like Skybox which lets you stream movies from your PC to your phone hence enabling you to watch movies in VR. Let’s look at all the different ways you can choose to get started with watching a 3D movie in VR! The easiest way is to search for videos on YouTube. Now, there are tons of 360-degree videos on YouTube that you can browse and it is possibly one of the best ways you can experience watching a short movie on a VR headset. There are plenty of videos that you would find on YouTube in different categories but you might not be able to watch a movie like Mission Impossible or The Heat. Basically, the 360 degree 3D videos give you a full out immersive experience as you can stand in one place and turn 360 degrees and still be able to see the VR environment. Whereas in teh 180-degree videos, you are going to be able to see the VR environment for only 180 degrees and the rest is going to be just a plain black screen which is not so immersive. So, always try to get videos that are in the 360 degrees 3D format to get the most immersive VR experience. Watching the videos is really easy with the Samsung Internet App, so it will not be a problem for someone who is trying to watch 360 degree 3D videos on Gear VR. The whole experience is really immersive if you get some great videos on YouTube with amazing quality. Let’s break down the steps on how you can watch these Youtube videos on Gear VR. 1. Open YouTube and search for videos that are in 3D format. 2. Now once you open the video you need to click on the setting icon on bottom-right and select 360 degrees. 3. Now select the video in 3D format and start playing the video. These settings are something you need to do manually before you can get started with watching any 3D 360-degree video on YouTube. A 3D Blu-Ray movie would simply not work on Gear VR. The movie has to be in teh side-by-side format or the Top-Bottom format for the movie to play in VR so that you can enjoy a normal Blu-Ray movie in VR. In this case, you have to use a converter so that you are able to convert a normal movie into a 3D SBS movie which is compatible with Gear VR. Now there are various tools with which you can convert a movie and you have both free and paid software to help you with that. Once you have converted your favorite movie into the desired format, all you have to do is transfer it to your SD card on your Samsung Galaxy phone and then play it on the Gear VR. This does take a bit of time and effort but if you can actually pull this off then you might get to see your favorite movie in VR which is an amazing experience. There are apps like Netflix VR as well where you feel like you are sitting inside your own personalized home theatre and enjoying a movie on the Big Screen without any disturbance. This is another possible way one can enjoy a movie in VR, so if you want to go ahead and enjoy a movie without any distractions then you might as well consider checking out the Netflix App. The reason I liked Netflix VR is that of the whole experience of watching a movie in your own personal theatre is taken to the next level. The environment is so cozy without any disturbance that you get totally immersed in watching your favorite characters. You can even use Skybox VR which would help you stream movies from your PC. This is another great way to enjoy movies on your Gear VR, however, the best way we would recommend is to either use an app like Netflix VR to get the feel of a home theatre or go for something like saving the movie on your phone so that you can watch it later on. I get it if you are totally into movies and would love to go straight for hours on your Gear VR. However, it might not be that great for your health and you might want to consider how long you use your Gear VR. You can use your Gear VR for hours straight, but you might just end up with a headache. If you really want to take advantage of the VR world, then it is extremely important that you take breaks in between your sessions. If you are watching a movie then taking a 30 minutes rest after 45 minutes of movie watching on a VR headset is really necessary so that you are able to relax your eyes. This might not feel important when you are actually into the movie but trust me you need to be careful. This not just applies to kids but to adults as well so even if you want to go all daredevil and watch an entire movie, it is highly advisable that you take the much-needed breaks in between. In the case you have motion sickness then make sure you take a 15-minute break until you get back to normal and then you can resume your movie watching experience. In the case you have any other tips, leave them in the comments down below!